Discussion in 'Tutorials' started by Pixelated_Pope, Sep 12, 2016. Great tutorial! I am having one issue though. For some reason it is drawing a black bar at the top of screen, but doesn't do it if I comment out the pixel perfect portion of the script. I'm using the GMS 2 version of the tutorial, have checked the code multiple times, but can't seem to figure out what might be causing it. My ideal height is set to 540 with my room sizes at 960x540. I don't recommend using the pixel perfect scaling... but that said, it certainly shouldn't give you black bars. What's the resolution of your monitor? 1920x1200. There is only one bar at the top of the screen (rather than one at bottom and top). Not sure why turning it off is fixing it either. I'll keep it turned off then! Ah, because your room isn't tall enough! When you scale it to be pixel perfect, it will scale the height to be perfect. 540 doesn't go perfectly into 1200, so it resizes your view to be 600 tall. Your rooms are only 540 tall, so you see the outside of your room, which is black. Ah that makes sense! Thanks again for your help. Great series - really appreciated the lead-up videos explaining the background of the topic and laying the groundwork for the system. Sorry for another question so soon, but I'm now having an issue where the text I draw is getting distorted (I think only in fullscreen mode). I did a check and my camera width/height are running at 864x540. My rooms are 960x540, my ideal height is set to 540, and my computer resolution is 1920x1200. Are you drawing your text in a gui event? When you are in full screen, do you have black bars at the top and bottom (you shouldn't)? No black bars. Seems to be an issue in both Draw and Draw GUI events. So, the only time there should ever be distortion is when aspect ratios don't match. Specifically your view and your application surface. Here's a script I use to debug all this. The numbers in the parentheses is your aspect ratio for that element. All of those numbers should be the same. If not, there's a chance for distortion. So that should give you an idea where to look. If you still can't figure it out, send me a screenshot, and I'll be happy to help you. Thank you for the scripts. I ran it, but it looks like they are all the same number. Here is a screenshot showing it. The issue is also definitely not the font either as when I run the game without the scaling system it looks great. I'm on the discord as well too! @IndieRex That is indeed weird. The only thing I can really think of is that there is some sort of pixel interpolation going on. Do you have that setting turned on? Even then, it looks weird. If you'd be willing, you could PM me your project and I'll see if I can figure out what's going on. This tutorial is the gift that keeps on giving for years now lol. and also i don't need any view to follow my characters. @rouzbeh78 Okay. First off, it looks like your game isn't pixel art based, so 720p is just fine . Remove all that. That alone may fix it for you depending on the resolution of your phone. As for view following your characters, I discuss how to do that in my Part 5 video. thank you so much that does the trick ! Thanks for the great tutorial @Pixelated_Pope!! The code works great also in GMS2. I wanted to separate the camera controlling code from the display manager object to its own. For a moment I had hard time playing with those global variables etc. Then by browsing docs I found a way to get completely rid of those by making the changes shown below. I decided to share this in case it's helping someone working with your great code. After that it's easy to move and update the view positioning code from the End Step event to another object as below. Of course one needs to set the instance to be followed in the Create event of this (or use object reference as in the original). Hi! I followed your tutorial in the hope it would solve my issues with jittering graphics, but it didn't. The camera follows the character and he looks fine, but when the view moves it seems as if everything else is wildly virbrating. Just look at the eye of the sprite in the beginning. I snapped a quick video of it with my phone (couldn't get the capture software to work with GM), can you help? Hi. Did you find a solution? Thanks! @instaboy Chances are the view was using the "object following" feature while also using an increased application surface size, which many people use without even realizing it. This causes jittering. Best thing to do is move to a manual camera control, and maybe add some smoothing as well. Thanks for the quick answer! I already use manual camera control (tried different versions). The main problem is that the player moves very smooth but other objects/characters are very blurry/jitter/ghosting?. Especially when the player (and the camera) move in the opposite direction than the other objects. It occurs more on higher move speeds, like 2px per step (640*360 base res.). This is really a show stopper. What do you mean by "add some smoothing as well."? Thanks in advance! Ah, okay. So, try this. Can you capture the issue in a screenshot? If not, this is likely an art issue. Obviously I've not seen your game, but I'm guessing it is fairly early and using a lot of placeholder art, with bright colors. When things with bright colors move quickly on an LCD monitor, you are more likely to get "ghosting" and other strange looking things. This is not an issue with your code, but with your art. It happens in almost all 2D games with fast motion, but you don't notice it because there are more interesting things to be paying attention to. So ultimately, your only solution is to ignore it until it goes away as your game gets more content and better art. If you don't believe that is the issue, you could send me a build of your game and I could see if I can reproduce the issue on my machine and offer some further insight. @Pixelated_Pope I saw your tutorials, they're amazing, thanks for sharing all that! I was wondering if there's anyway to keep the quality of sprites when down scaling instead, or should I never down scale at all? @Rekenq By down scaling, you mean displaying a larger view in a smaller application surface? It is an HTML project that needs to run on both PC and Mobiles. The viewport size is 928x522 (the same as the camera's), which is the max 16:9 resolution we could fit on the page. But this resolution is too big for some mobile devices so we resize the window and surface to half that. The problem is that the animated sprites lose a lot of quality, they show a lot of visual artifacts and aliasing. Should I be doing the opposite? Designing on 464x261 and then up scaling like in your video? Oh, yeah. If you are scaling down pixel art, that's going to look awful. If it's not pixel art, you could just turn on interpolation, and it would look pretty great. Alright, I'll give that a try! Thank you very much for your help! I've seen all your videos on this subject, but unfortunately I'm new enough in GM and I'm having trouble getting your codes working properly in my project, so I'd like to ask you if you can help me. My project is entirely in pixel art, so I have to make sure that the pixels are correctly scaled, to avoid sprites malformation. The game must be played on a mobile in a vertical position (portrait). As you can see inside the room there is a box. I would like that box to always be in that position in whatever resolution is displayed. In short, I need the objects in the room to always be displayed at the usual locations. So I thought to always keep the usual vertical height, and act on the horizontal background, to match the aspect ratio of the screen of the mobile device (I would like to avoid having black bars in the game). To make this method work I have to use the views inside GM (I'm not currently using it, and I have placed all my objects based on the room's coordinates). At the code level, how should I proceed to have a correct size port without black bars, and still have a correct pixel art display? Looks like you are on the right path! You need to use views to properly manage your resolution in most cases. Another option is to disable the automatic drawing of the application surface and draw your app surface manually in the GUI event. Then you can maximize the GUI and draw any image you want in the background while drawing your app surface scaled up as much as possible and perfectly centered. I did a test on my pc with this code (not tested on mobile devices). In your opinion could you go using the view option? As for perfect pixel art scaling, should I have problems? If I start a test with this code, a window of 720 (h) x1280 (w) is created. //Setup all the view ports so I don't have to. Also I wanted to ask you if I can leave my room size at 360x640 and simply insert a larger background, or if I have to enlarge the room completely, so that if the view has to be enlarged the room has free space for it. Are you on GMS2? If so, you might want to check out my latest tutorial to simplify this a bit. You don't need to create "cameras" or use that for loop to set up the views. As for your code, I don't see anything immediately wrong with it. you can definitely roll with just using the dynamically sized view. And, as far as I know, the only thing 'room size' really matters for is when you are using tiles. Other than that, your room can be literally any size. GMS1 or GMS2? Also, I recommend joining my discord server (link in my sig) and we can talk about this in real time. Much easier to debug that way. ah yes i see cause im asking for the extra height ? 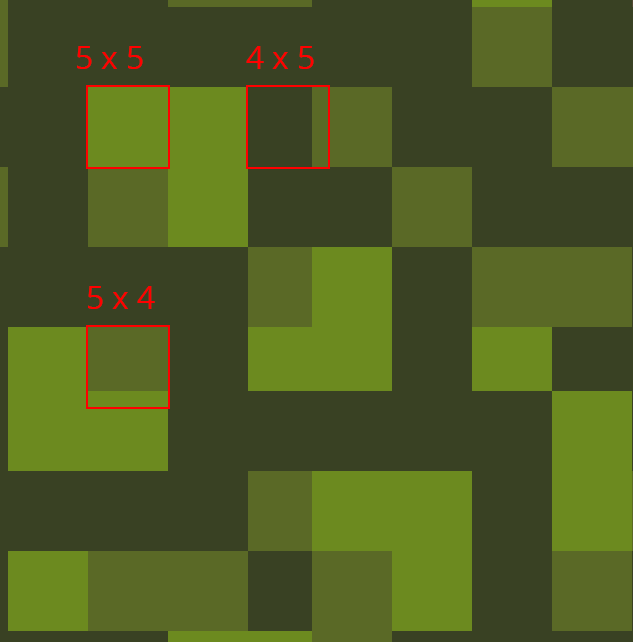 hmm now i understand why scaling in none intergers is bad , ok then so gms2 wont work with none widescreen ? how do i stretch the height , keeping black borders on the side without being in a box ? i dont get this considering gms2 is supposed to be mostly for pixel art ? the old gm didnt have this problem dont tell me im going to have to redo all my pixel art for the sake of a few pixels ? its so annoying . it's native resolution is 256x224. But that up there is scaled up to fit a 1080p monitor (if you view the image in full screen.) That's a scale of 4.821428...x Can you spot the pixel distortion? Even if you could pick it out in a static screenshot, I'd bet you'd have a hard time noticing it when actually playing the game. But it is definitely there. 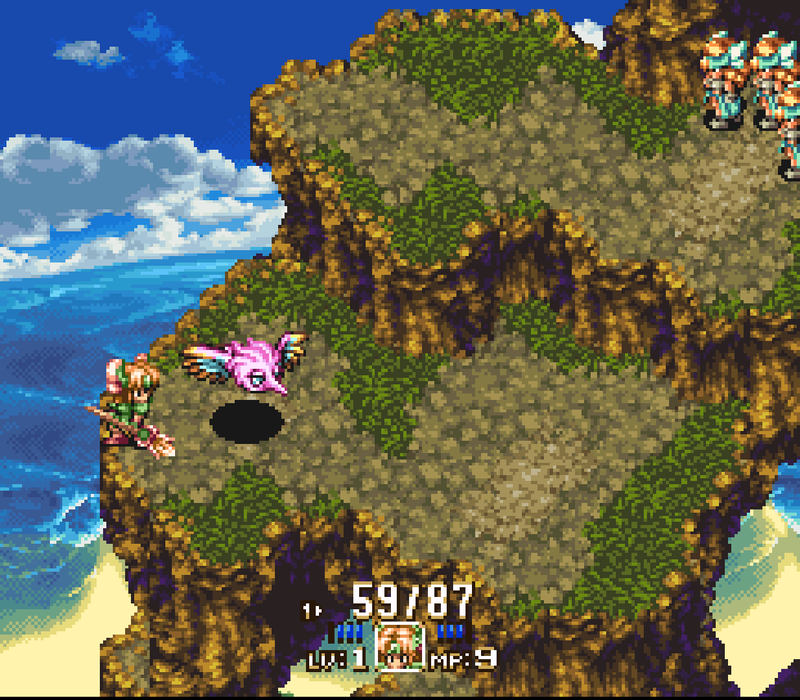 Most people play emulated SNES games at 1080p on their PCs, and very few complain about this sort of distortion; not because it isn't present, but because it isn't noticeable at this scale. So if you are seeing really serious distortion at your chosen resolution when scaled to 1080, I would first make sure you are scaling correctly and there isn't anything else at play. And then I'd examine your art style... maybe it's making distortion more obvious? I'd have to see a screenshot of your issues to know for sure. yeah i went away calmed down and had a nice brain squeltch, you've basicaly just replied what i was thinking of haha, yeah i'll be honest i'm a big emulator guy so i should know about all this , mabye i got confused by digesting 1000s of hours of pixel art lectures and the beauty of 240pixels of platformer specialisation (since making platformers in widescreen is .... silly unless you design your levels with widescreen in mind , i am however still dumbfounded as to why gamemaker doesnt just add the extra pixels into the borders on the side(how i would like) so doing a little calulator ive worked out the levels need to be made with 480 x 270 in mind ? i am also thinking , that mabye i never noticed the distortion back in 2008 cause i was on a 4:3 crt monitor , i just ran my stone age 2008 gm8 game on my 1080 and yes pixel distortion soooooo ...... looks like im going to be forced to make my levels in widescreen meh . That's not necessarily true either. Your desired aspect ratio is 4:3 (1.3333). So if you pick a desired height that is a whole number factor of 1080 (so either 270 or 216) and then calculate the width based on the desired aspect ratio (1.333) you get two possible, non full screen resolutions that will scale perfectly to 1080p with black bars on the sides: 280 x 216 or 360 x 270. Design your game around either of those resolutions, and you'll scale well on 1920x1080 monitors. Thank you so much pope , 280 x 216 was the golden number for my 8 bit games and 360 x 270 for my 16 bit games , you just fixed everything yippeeee !!!! ideal_width=0; //Doesn't matter because we are going to calculate this. //Check to make sure our ideal width and height isn't an odd number, as that's usually not good. My game room has dimensions 360x640 (horizontal orientation), and the background I use is 360x640. In the code I inserted an "ideal_height" of 640, just because I would like to keep the original height, and only modify the width to fix the aspect ratio. The problem is that the height of the window is also changed and the resolution no longer has a height of 640 as you can see from the screen). Is it not possible to make the camera have a height that perfectly covers the height of the background? Running the code on a mobile device, I encounter problems in the click of many objects that have been placed inside the room through normal coordinates (they are displayed correctly). Do I have to place them by code based on other coordinates? Okay, first off, since you are developing your game for a mobile device in portrait mode but aren't developing your game on a monitor in portrait mode, you will need to replace "display_get_width & height" with hard coded values to get your game window to display properly when building locally. It's a complicated problem, but this is how I solve it for my projects that support different aspect ratios.